LINCOLN, Neb. 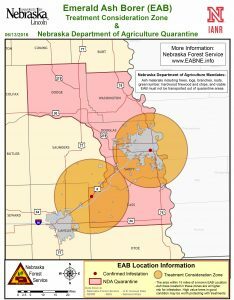 — The Nebraska Department of Agriculture (NDA) has announced a second discovery of the emerald ash borer (EAB) in Greenwood, NE. This confirmation places this destructive insect within 15 miles of Lincoln and six miles from Waverly. 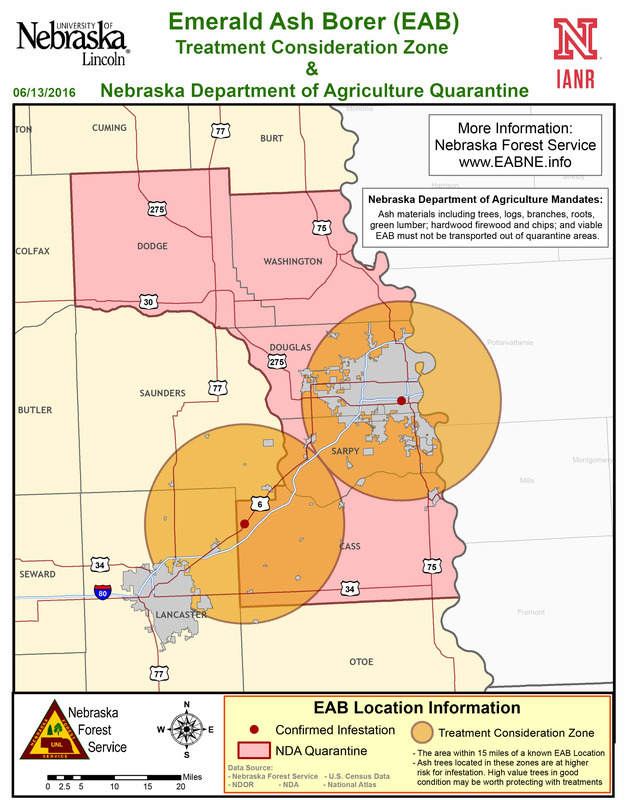 NDA’s quarantine zone currently includes Douglas, Sarpy, Cass, Washington and Dodge counties. It specifically restricts the movement of firewood and wood waste from the zone. “Following the quarantine and restrictions will help slow EAB’s spread, giving homeowners, communities and land managers time to start proactively removing or treating their ash trees,” added Erixson. Regardless of the borer’s current location, municipalities and anyone managing large numbers of ash trees outside of the quarantine areas should take steps now to prepare for EAB. The Nebraska Forest Service (NFS) recommends focusing on removal and replanting of trees now, giving new trees several years to become established. Treating ash trees is an option; although, treatments will not save trees forever. Each treatment will need to be continually reapplied and will only prolong the tree’s life, not save it. Any treatment should not be carried out before the insect is confirmed within 15 miles of the trees. Based on the experiences of other states, the NFS predicts that more discoveries of EAB will take place over the summer. While it will take a few years to see large scale losses of ash trees in these areas, it is critical that preemptive action, such as early removals and treatments, takes place now. Nebraska becomes the 27th state to discover EAB. It is projected that Nebraska’s taxpayers and homeowners will spend over $961 million on ash tree removal, disposal and replacement of nearly one million trees in our communities. More information about the emerald ash borer, the NDA quarantine, finding an arborist, and recommendations for homeowners and municipalities can be found at www.eabne.info. LINCOLN, Neb. 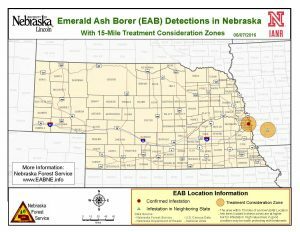 — The Nebraska Department of Agriculture announced today that the emerald ash borer (EAB) was found earlier this week in southeast Omaha. This is the first confirmation of the insect in Nebraska. EAB has killed hundreds of millions of ash trees in 26 states. It is projected that Nebraska’s taxpayers and homeowners will spend over $961 million on ash tree removal, disposal and replacement. Residents with ash trees in the Omaha area may want to begin treatments. Professionally applied trunk injections are the most effective treatments, especially for large trees. Their main drawback is the damage they cause to the tree and therefore are best applied by certified arborists well-trained in the procedure. The most common products available to the homeowner are soil applications, but they are somewhat less effective than injections and have a greater chance of harming beneficial insects, such as bees. for. The current treatment consideration zone extends from Fort Calhoun to Plattsmouth and from Gretna to east of Council Bluffs. 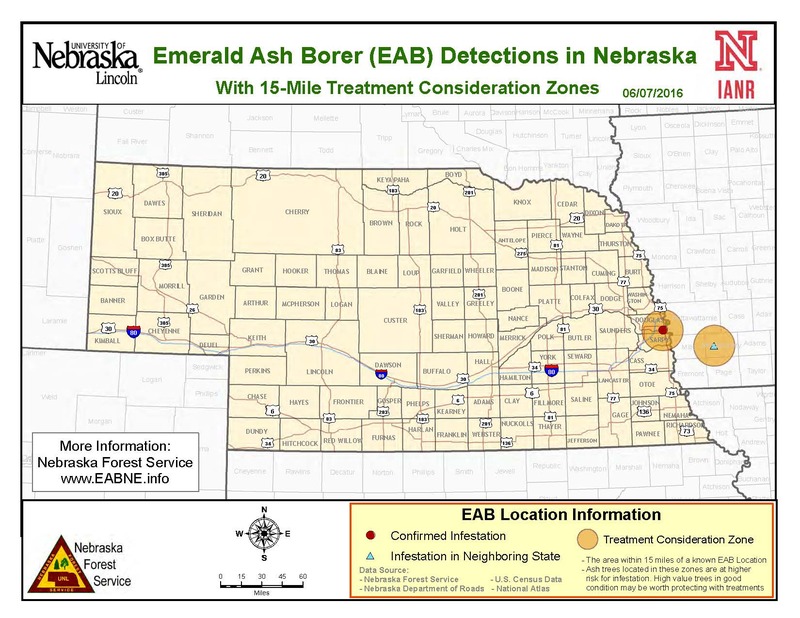 Municipalities and anyone else managing large numbers of ash trees even if they are outside of the Omaha area should take steps now to prepare for EAB. As trees are removed, they should be replaced with a diverse selection of trees, not just a few species. This will help avoid another significant loss of the urban tree canopy when the next serious pest arrives. More information about the emerald ash borer, finding an arborist, and recommendations for municipalities can be found at www.eabne.info.